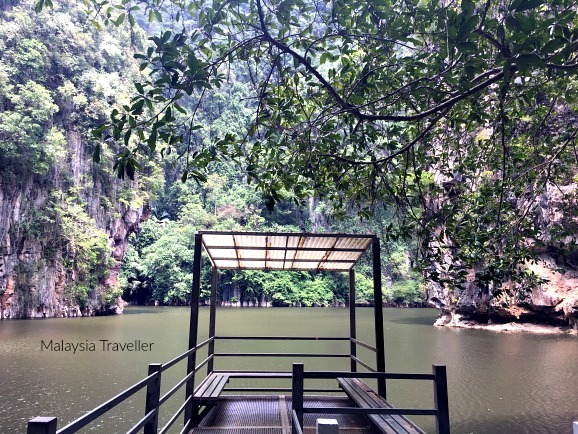 Tasik Cermin, or Mirror Lake, is a stunning hidden lake surrounded by limestone karst towers. 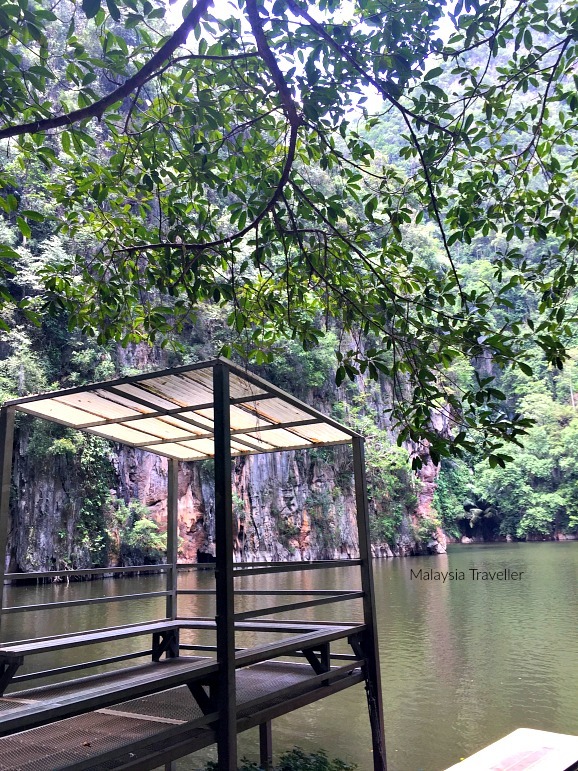 I have visited hundreds of lovely places in Malaysia, but this is one of the most spectacular natural settings I have seen. 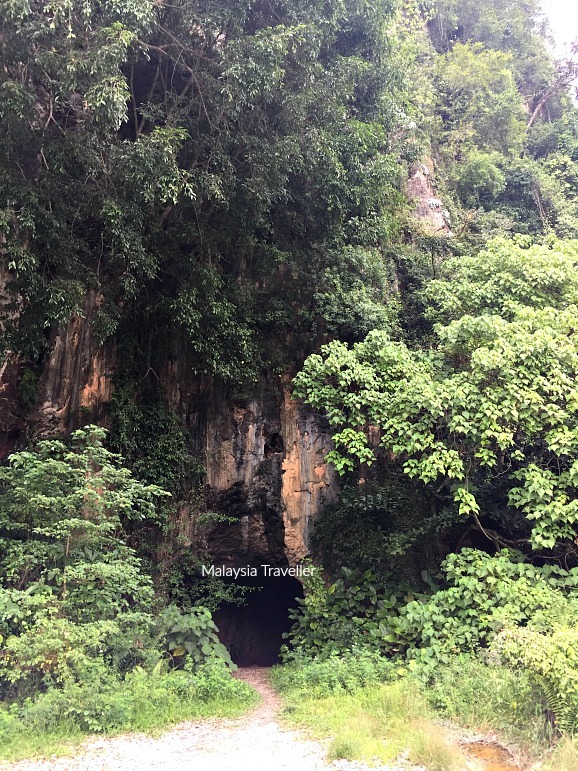 There are actually two lakes concealed within this karst formation but only one is currently accessible. How long have these lakes been here? 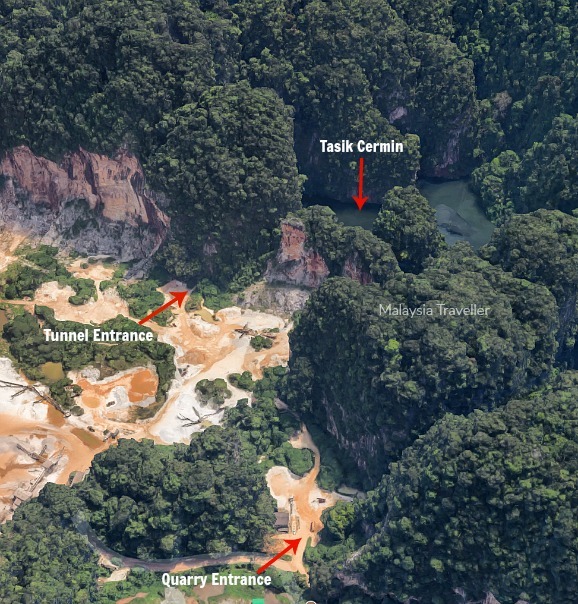 What kinds of animal, fish or plant species might be endemic to this particular isolated spot? These images were taken in August 2017. Sadly, the lake is under severe threat from quarrying and who knows whether it will be around much longer. Go now while you still can. If enough people know about this beautiful place and make a big fuss perhaps it can be saved. These Google Maps 3D images clearly show what is happening. 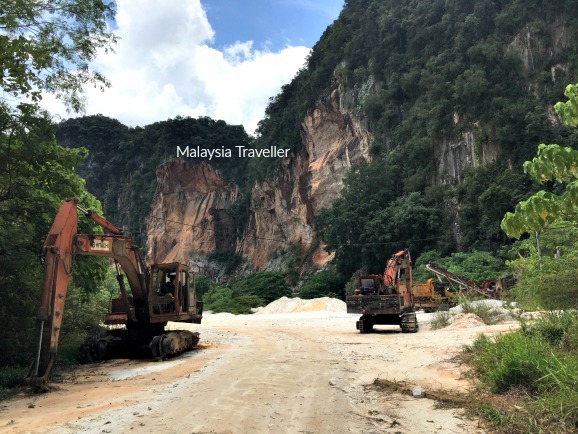 The age-old limestone karst hills known as Gunung Rapat, which give Ipoh its nickname of ‘Guilin of Malaysia’ are being hollowed out from the inside by uncaring quarry operators. 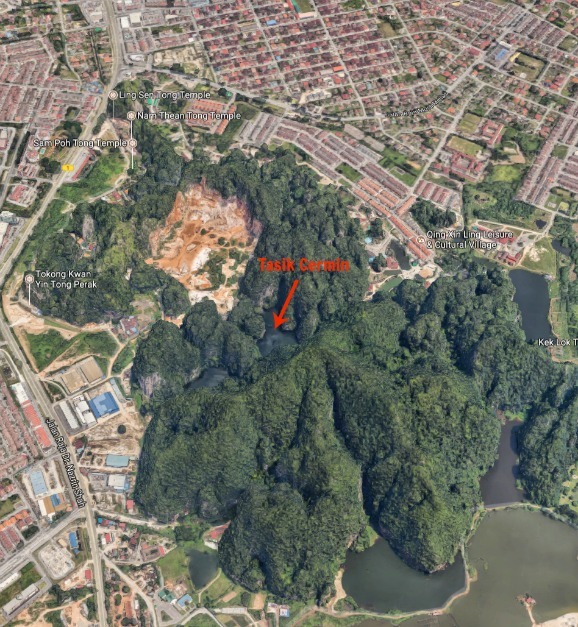 Soon only the outer facade of the hill formation will be left, threatening not only this lake but also the famous cave temples such as Sam Poh Tong and Kek Lok Tong which draw in tourists from around the world. These are the coordinates for the tunnel entrance. 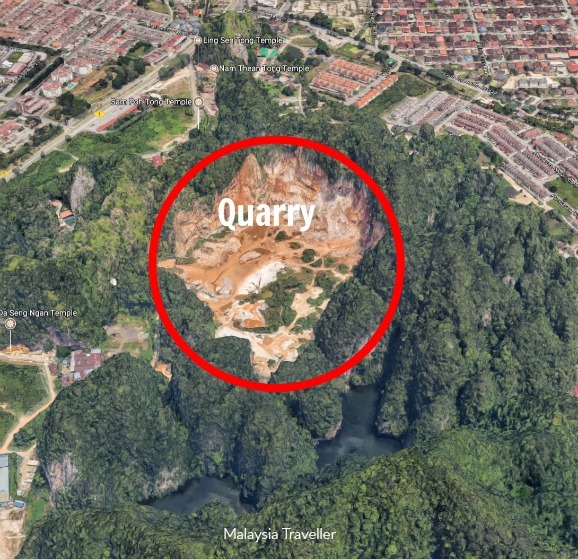 To reach the lake you first have to enter the quarry. I went on a Monday when the quarry was working but the access road was blocked by this barrier. 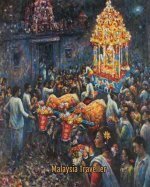 I had already left my car at the nearby Da Seng Ngan Temple so I was on foot. I stepped over the barrier (next to the ‘no entry’ sign!) and a quarry employee approached me. 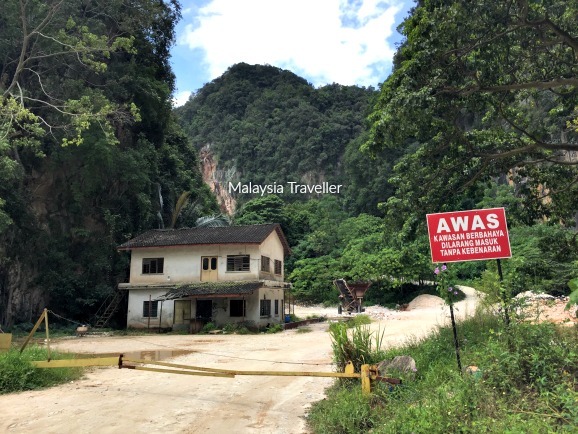 I told him I wanted to go to Tasik Cermin and he waved me in so I guess they are not too strict about the no trespassing rule. Deeper into the quarry I asked one of the excavator drivers for directions to the tunnel. He was surly and unhelpful. What did I expect from somebody who destroys nature for a living! It did not take long to find the entrance to the tunnel. It is probably about 50 metres long. It is dark of course but you can see ‘the light at the end of the tunnel’ so it is not too scary. This fifty second video shows what awaits as you emerge from the tunnel. Why did the quarrymen build the tunnel? Just to be public-spirited? Or perhaps they wanted to survey the potential for future quarrying? That sounds more like it. But at least they made this nice viewing platform. It was surprisingly silent at the lake and any noise from the quarry did not reach here - just a few bird songs and the sound of leaves rustling in the gentle breeze. Unfortunately the water was not too mirror-like during my visit perhaps due to recent heavy rain and the time of day. 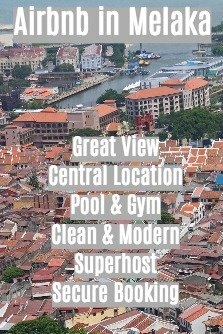 Actually there is nothing to do here apart from admire the scenery and take a few photos. 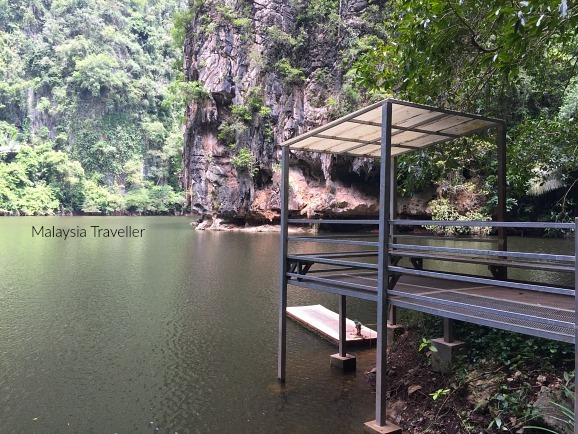 You can sit on the viewing platform but it is not possible to walk around the lake edge. I guess you could try fishing. There is a small raft next to the platform but presumably not for public use. It is certainly a special place. You should try to visit it soon before the quarrymen destroy it.